The Shinto god of thunder, lightning, and storms, Raijin has a demonic appearance and is generally shown beating drums. The Brown Raijin Sakura Katana displays eye-catching Raijin and Mount Fuji designs on each side of the tsuba. 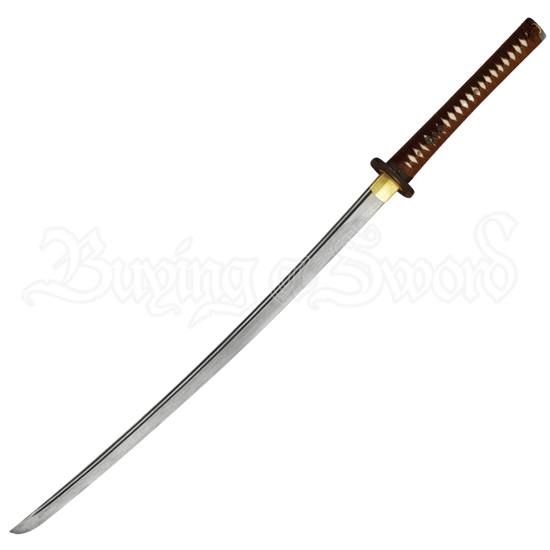 The functional katana is crafted from Damascus high carbon steel and features a fullered blade. The handle is made of authentic, top grade ray skin and then wrapped with brown silk. The accompanying piano brown lacquer scabbard is inlaid with golden sakura designs, offering a final touch to the design. This samurai katana comes with a certificate, sword bag, and cleaning kit, making it a great choice for collectors and swordsmen.